Located on a steep slope overlooking the most beautiful of Greenland’s fjords, the 3000 m2 National Gallery will serve as a cultural and architectural icon for the people of Greenland. The new museum will combine historical and contemporary art of the country in one dynamic institution The winning proposal was selected by a unanimous museum board among 6 proposals, including Norwegian Snøhetta, Finnish Heikkinen‐Komonen, Islandic Studio Granda and Greenlandic Tegnestuen Nuuk. ”The building will with its simplistic coarseness and harmony with the landscape become a symbol of the current independent Greenlandic artistic and architectural expression.”, Andreas Klok Pedersen, Partner & Project Leader, BIG. 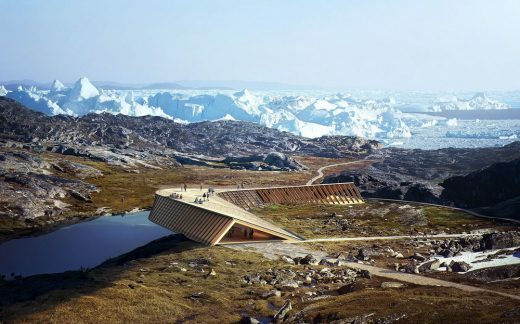 “Greenland National Gallery for Art will play a significant role for the citizens of Greenland and the inhabitants of Nuuk as a cultural, social, political, urban and architectural focal point that opens towards the city and the world through its perfect circular geometry and shape”, Bjarke Ingels, Stifter & Partner, BIG.